Luckily, there are a ton of options for you to choose from. We put together a guide of our favorite places to stay that aren't huge hotels. Check 'em out! If you’re looking for a quaint boutique hotel that feels like luxury without losing the laid-back Austin attitude, this is it. Hotel St. Cecilia (named in honor of the patron saint of music and poetry) pays homage to the late 1960’s and early 1970’s, "when a revolution of rock and roll and beat poetry overran the hallowed halls of established convention." This is the perfect place for tortured artists, creative souls and bohemian spirits. Plus, you'll have the eclectic South Congress neighborhood just outside your door. Austin Motel has been around since 1938, and has since become iconic with its landmark sign. The much-loved motel is located smack-dab in the middle of South Congress, and within perfect walking distance to quirky shops, restaurants and bars, as well as the Congress Bridge (if you're planning on seeing the bats). Enjoy a swimming pool, patio bar, 41 unique guest rooms, and the bragging rights to say you've stayed in one of the most recognizable places in Austin. With its stucco walls and lush garden courtyards, Hotel San Jose will make you feel like you just stepped into a secret and exclusive forest hideaway tucked away in the bustling streets of Austin. Set in a 1930s motor lodge, Hotel San Jose has minimalist rooms decorated with ethnic fabrics and handmade furniture, truly following along with its leafy, bohemian theme. Don't miss the beloved courtyard bar, which features occasional jazz music and guaranteed good people-watching along South Congress. Take the trendy, chic and unique vibes of Austin, mix it with an effortlessly sleek style and decor, and you’ve got the South Congress Hotel. As the fourth addition to Austin's popular South Congress neighborhood, South Congress Hotel rounds out the SoCo neighborhood with a fine boutique design and minimalist rooms. Guests can also enjoy the hotel's many bars, restaurants and coffeeshops (Central Standard, Cafe No Se and Manana), as well as the devilishly cool Revival Cycles on the ground floor. Striking, sleek and the epitome of “modern,” Kimber Modern will make you feel just as sophisticated as its stylish design. The rooms and suites are all white with pops of color and artwork from three local Austin artists: Martha Gannon, Margo Sawyer, and Valerie Fowler. According to designer Kimber Cavendish, the goal was “to create an exceptional architectural work of art, tailored toward the independent urban traveler.” Only a block away from SoCo’s bars, this beautiful and strategically designed boutique hotel is perfect for those with a suave taste and love for Austin’s eclectic personality. A unique boutique with an easy-going and hip twist--just like the city it calls home. Heywood Hotel is within walking distance from downtown, Rainey Street, Sixth Street, Lady Bird Lake and the Texas State Capitol. Its seven individually designed rooms makes every person’s experience uniquely their own. To top off its Austin elements, Heywood Hotel also features locally made art. This is another fantastic spot that takes Austin culture and translates it into a memorable stay for its guests. A Japanese-inspired boutique hotel with a zen ambiance, Casulo Hotel will instantly relax you from the stress that comes with traveling. From its high ceilings and spacious rooms to waterfall baths and rain shower heads, you will feel pampered to no end--and understand the true meaning of zen. Casulo Hotel is conveniently located between Austin’s Bergstrom airport and south of downtown. This is the perfect place to make a statement. Set within the Goodall Wooten House (which is one of Austin’s original landmark estates and dates back to 1898), Hotel Ella is the very definition of a beautiful historic boutique hotel. Located in downtown Austin and just a 10-minute walk from the University of Texas campus, it's also a perfect spot for parents who are visiting their kids. Hotel Ella boasts a mix of Austin’s present and past; the hotel’s Greek-style mansion comprises of 47 rooms, a pool, and a wraparound veranda overlooking the front lawn. The property is also bookable for corporate events, social meetings, and weddings. With its beauty, versatility and rich history, Hotel Ella is a must-see visit and stay. Native Hostel is all about providing a place for young adventurers to have fun, build connections, and create meaningful experiences. The relatively new hostel has bedrooms with 4 or 6 beds with privacy curtains, individual lamps and locked storage for each guest. Native Hostel also boasts a gorgeous lounge and bar with live music, and you'll likely find many Austin locals here on a night out. Comfort, friends and good music…it doesn’t get better than that. The Firehouse Hostel and Lounge is located on an actual firehouse. But this isn’t just any firehouse--it's the oldest standing firehouse in downtown Austin! The fine folks at Firehouse refurbished the space (built in 1885) while also maintaining and featuring the many unique and charming features of the historic structure. You'll be within just a few minutes walking distance from Austin’s Sixth Street, so stay here if you want to enjoy the raucous side of Austin nightlife without straying too far to get home. Firehouse also has a bar (hidden behind a bookcase!) that manages to feel both romantic and moody at the same time. Come here for a Gold Rush and rowdy live music, stay for the interesting people you'll meet. Calling all free-spirited travelers, creative thinkers, innovators, artists, and the like! 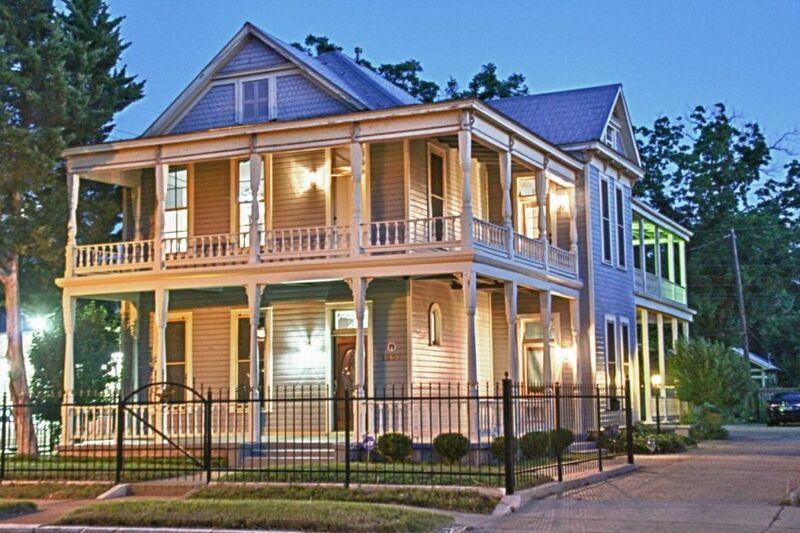 HK Hostel is a co-living space situated in an elegant Victorian mansion that's a registered historic landmark of the City of Austin. This hostel is located in the heart of East Austin, where you'll be close to a ton of bars, restaurants, artists, yogis and bike-friendly streets. Stay here if you're looking for a comfortable and easy-going environment, and enjoy the kinship you'll definitely build with your hostel mates. If you want a breathtaking view of Austin in all its glory, HI Austin is the way to go. HI Austin is nestled on the shores of Lady Bird Lake, and only minutes away from downtown, hiking and biking trails, and the Colorado River. You're also close to the Red River music district, South Congress and Barton Springs. We love HI because it's a cozy and laid-back lakefront hostel that's close to nearly everything (also, having free parking doesn't hurt). You'll be wondering how you can make this your permanent home.